In the UK, the Sky Arts Channel is doing a retrospective on the South Bank Show. The subject of the first episode of the South Bank Show was Paul McCartney & Wings, the band was down to a trio at the moment, and was captured doing some vocals for Mull of Kintyre. The clip below from the show was published on YouTube by Sky Arts. The full show, courtesy of a broadcast in Norway, has been circulating among collectors since then - with subtitles in Norwegian. It'd be good to get a good quality version. 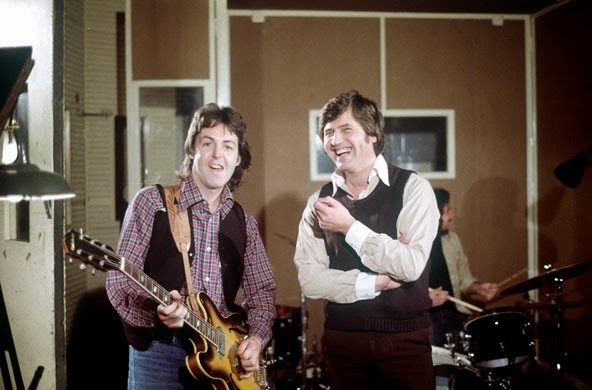 The listing of the show says: Melvyn Bragg looks back at the first ever episode of The South Bank Show in 1978, in which he met Beatles singer-songwriter Paul McCartney. (S1, ep 1). Sky Arts listing. The South Bank Show was a television arts magazine show that was produced by ITV between 1978 and 2010. Conceived, written and presented by former BBC arts broadcaster Melvyn Bragg, the show aimed to bring both high art and popular culture to a mass audience. In 2012, Bragg brought the series to Sky Arts, hence their retrospective. Several of the show's original episodes were Beatles related, including The Making of Sgt Pepper's Lonely Hearts Club Band, from 1992.